Pamela Sunday (American, b. 1955) makes ceramic sculptures inspired by nature. Her interest in natural forms dates to childhood, when she played alone in the woods, combing the ground for fossils and hiding in hollowed out trees. She is known for her meticulous craftsmanship and the inventiveness with which she explores the limits of her materials. 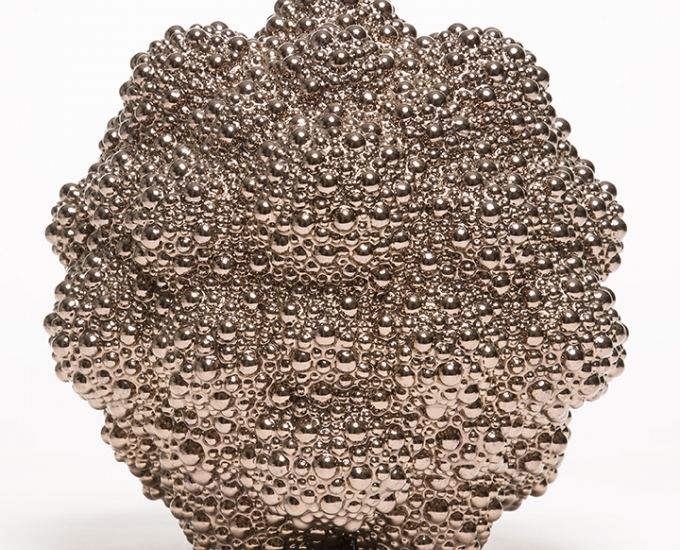 Her works are hand built, often originating from the basis of a simple sphere, but morphing into models of magnified particles, shrunken down celestial orbs or other fantastical shapes. For their surfaces she has developed a repertoire of glaze formulas ranging from subtle earthy textures to brilliant metallic shimmers. Sunday studied economics at Fordham University and upon graduating went to work on Wall Street. After three years she had a chance opportunity to try out as a fashion stylist which she did during a two-week vacation. At the end of the holiday, she submitted her resignation from the banking industry. Soon after entering the fashion world she was hired as the head stylist by Bergdorf Goodman and later promoted to Art Director. There she collaborated with an array of renowned photographers, including Herb Ritts, Albert Watson, June Newton, Matthew Rolston, Scavullo and many others. In the mid-90s, together with a group of fellow art directors, and initially as a social outing, she decided to take a ceramics class at Greenwich House in New York. This happy accident completely transformed her life. She was irrevocably smitten, fascinated and obsessed by clay and hand-building. She quickly developed a rigorous studio practice and never looked back. Today her work is exhibited and collected internationally, and she collaborates with top architects and designers to create sculptural installations and unique design objects. Sunday's early artistic influences include the photography of Karl Blossfeldt and the minimalist soundscapes of Phillip Glass. She is inspired by repetition, ritual, topologies, and the natural world. After decades of living and working in New York City she recently moved to Catskill, NY.